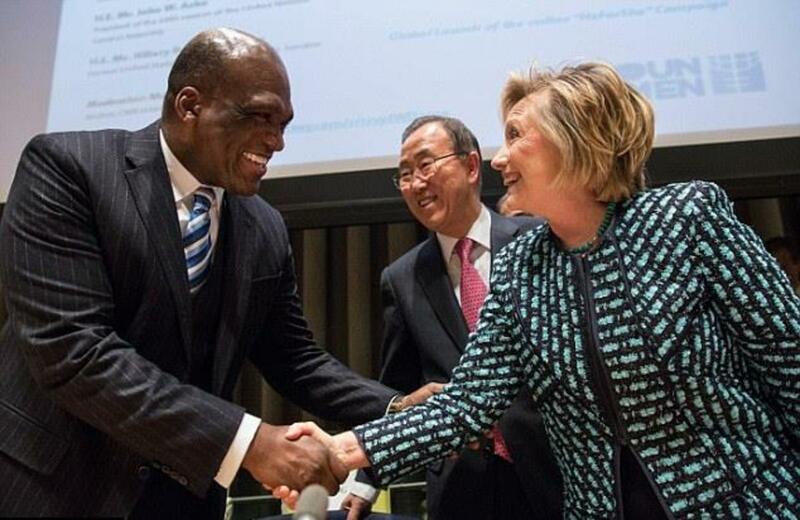 New York, NY – The suspicious circumstances surrounding the death last week of former U.N. President John Ashe has left political pundits and conspiracy theorists alike speculating as to whether foul play was involved in his untimely demise. After Ashe was found dead Wednesday, the U.N. claimed that he had died from a heart attack, according to the New York Post’s Page Six. That claim was later disputed by local police officers in Dobbs Ferry, New York, who said that Ashe had died from a crushed throat during a workout accident. What makes this mysterious death so intriguing is the fact that Ashe was due in court on Monday with Chinese billionaire co-defendant Ng Lap Seng. Ashe was accused of receiving at least $500,000 in bribes to use “his official position to obtain for Ng potentially lucrative investments in Antigua,” according to a criminal complaint charging Ng. “In exchange for the payments from Ng, among other actions, Ashe submitted a UN document to the UN Secretary General, which claimed that there was a purported need to build the UN Macau Conference Center,” the complaint alleges. Ng being the mega-rich Chinese national who used a proxy to pour more than $1 million into the Democratic National Committee and the Clinton-Gore campaign back in 1996. Scandal was joined by embarrassment when it turned out that Ng had been favored with 10 visits to the White House, including an elevator ride with Hillary Clinton. Adding to the intrigue surrounding Ashe’s death, an anonymous source who spoke with Page Six, said prosecutors had intended to use the fact that Ng had funneled money to the DNC during Bill Clinton’s presidency in an effort to link Ashe directly to Democrat front-runner Hillary Clinton. While there is currently no evidence to corroborate the theory put forth by the anonymous source, there is no lack of speculation in the public arena as to whether the Clintons are connected to Ashe’s death. There have been long-standing conspiracy theories regarding the unfortunate and sometimes suspicious deaths of people intimately connected to the Clinton political machine. However, Ashe’s lawyer, Jeremy Schneider, strongly disagreed with the implication that his client’s death was the result of a Clinton conspiracy, while at the same time lending credibility to the overall speculation of Clinton involvement in at least one of the suspicious deaths. Vince Foster was a deputy White House counsel who allegedly committed suicide in 1993. Persistent theories suggesting that his death was, in fact, a murder have maintained for years —specifically implicating Hillary Clinton. While there is no direct evidence to prove the veracity of this theory, the Clintons deep connections to the CIA and clandestine activities have been readily documented. Bill Clinton is alleged, by an FBI/CIA whistleblower, to have protected Mena, Arkansas air base and flight operations as a hub of the Iran-Contra drug for guns operation. He is also rumored to have subsequently received quid pro quo CIA support that secured his meteoric rise to the U.S. Presidency. When it comes to the Clintons there is no telling how deep the rabbit hole goes, as they have been intimately connected to the U.S. intelligence apparatus for decades. While there is no evidence to directly connect the Clintons to Ashe’s death, the political convenience of Ashe’s death seems eerily suspicious.